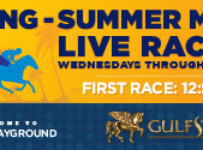 Wednesday, Aug. 25 – A carryover of $393,366 in the Rainbow 6 will be a big attraction at Gulfstream Park on Thursday as it begins another four-day week of summer thoroughbred horse racing. 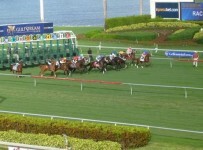 Thursday’s Rainbow 6 will be on the fifth through tenth races. It is a 20-cent only per combination bet with a 20% takeout. First post this weekend is 1:15 p.m. on Thursday, Friday and Sunday and 12:45 p.m. on Saturday. The Rainbow 6 carryover has been growing since July 16. That was 23 Gulfstream race days ago, and the last day on which there was just one Rainbow 6 ticket with the winners of all six races. The payoff was $164,483. Gulfstream pays out the full Rainbow 6 pool (day’s bets plus carryover) only on days when there is just one ticket with all six winners. On other days, Gulfstream divides 70 percent of the day’s Rainbow 6 bets among the multiple winning tickets and puts 30 percent into the carryover. 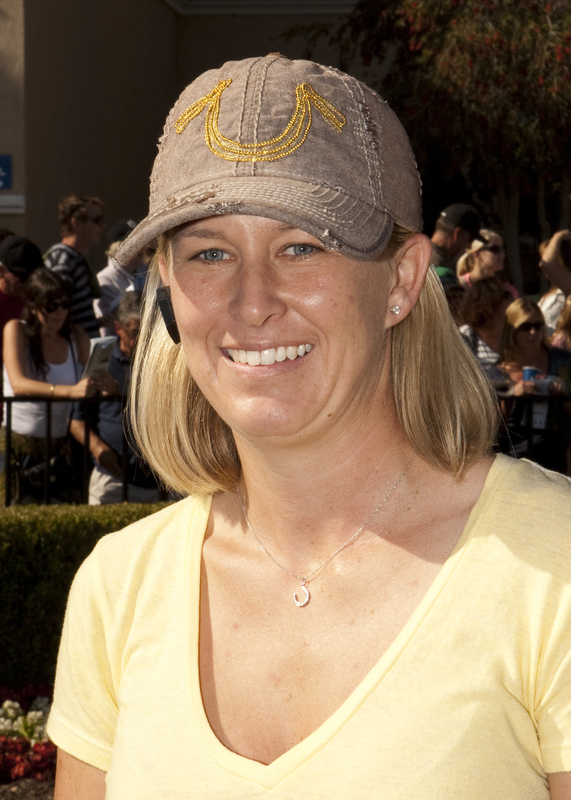 Thursday’s Rainbow 6 races have 53 entrants, relatively small for the sequence. The feature ninth race is a $16,000 optional claimer at one mile on dirt for 3-year-olds and up. It has a $44,000 purse. The race has just six entrants and for that reason should be a leg where many bettors will go for a single on their Rainbow 6 tickets. Old Times Sake likely will get the most attention, Top alternatives would be Rich Daddy and Thunder Basin, trained by Kristin Mulhall who is enjoying fast success on her trips in from California. Old Times Sake, a 4-year-old gelding, is making his first start off a claim by high percentage trainer Peter Walder and Looch Racing Stables. 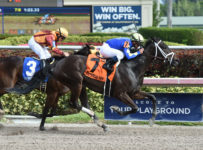 The claim from trainer-owner Herman Wilensky was on July 11 at Gulfstream when Old Times Sake finished third in an eight-horse field at seven furlongs on dirt. Old Times Sake has finished third of better in eight of nine starts on Gulfstream’s main track, and has the highest recent Brisnet speed figures and most consistent running times in the field. He has three wins at a mile on dirt at Gulfstream this year – but all at the $6,250 level and for three different trainers. Walder has tabbed Harry Hernandez to ride. He is second in Gulfstream wins this summer to Tyler Gaffalione, Each is a five-pound apprentice. Assistants will saddle Rich Daddy because Garoffalo is at Saratoga with Wildcat Red. That 4-year-old Gulfstream fan favorite is entered in Saturday’s seven-furlong Forego Stakes (Grade 1) at Saratoga. Thunder Basin, 4-year-old gelding, was her first starter and first winner a Gulfstream in a one mile $35,000 maiden race on Aug. 6. He is facing winners for the first time. Eddie Castro has the return mount. Mr. Amos, winless in five Gulfstream dirt starts, and Sonofaderbywinner, who has never raced beyond seven furlongs, complete the field.